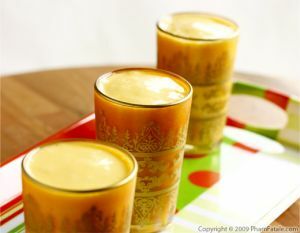 After making mango lassi, I add some leftover mango pulp and I had a tin full of ginger snaps from yesterday. I knew I was onto something decadent. I ran to the grocery store and got some heavy cream and some white chocolate. At the store, it occurred to me that the lemon apeels (lemon-flavored chocolate chips) would give the dessert more flavor than plain white chocolate. So what could I make with all these lovely ingredients? 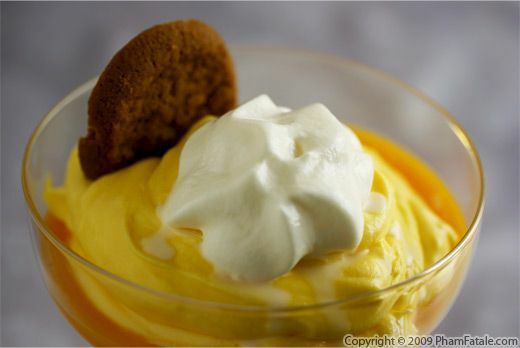 The answer is an egg-free mango mousse flavored with lemon apeels and garnished with homemade ginger snap cookies. Reserve 1-1/2 cups of mango pulp. Set aside. Finely chop the lemon apeels. 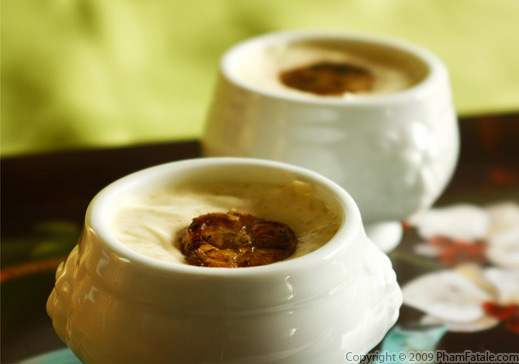 Fill a saucepan with 2 cups of cream. Bring it to a near boil. Turn off the heat immediately and add the lemon apeels. Using a spatula, keep stirring until the morsels are melted (see tips). Let the mixture cool completely. You might want to stir the mixture every 15 minutes to keep it from forming a skin. Once cooled, using an immersion handheld blender, whip the cream (at a low speed) until creamy and smooth for about 2 minutes. Add the rest of the mango pulp and pinch of salt. Clean your handheld mixer in hot soapy water. Always make sure the beater blades are completely clean prior to whipping cream for optimum results. The whipping cream should be whipped cold. Whisk the rest of the heavy cream (3 cups) for about 2 minutes at a low speed. Add the rum and mango extracts (if used) and increase the speed of your mixer and keep beating for another 2-3 minutes until it forms soft peaks. Do not over-beat or the texture will become grainy. Reserve 1 cup of whipped cream in a bowl and chill it in the refrigerator. Using a silicone spatula, mix 1/3 of the whipped cream with the lemon-mango mixture to soften it. Add the rest of the whipped cream and gently fold in the mousse to get an airy batter. Transfer the mousse to a pastry bag fitted with a round tip. Spoon 4 tablespoons of the reserved mango pulp per glass. Pipe the mango mousse. Plastic-wrap each individual glass and chill in the refrigerator for at least 3 hours. The fat from the cream may pick up other food odors from the refrigerator if the glasses are not sealed properly. When serving, unwrap the glasses and top with a dollop of the reserved whipped cream. Garnish with 2 gingersnap cookies per glass (I used only one for the photo). Serve immediately. I prefer using canned mango pulp because the mangoes are picked at the peak of ripeness, which guarantees a consistent result. I get it at the Indian store but you can also get it online. I prefer the Kesar mango variety, which is much smaller than the Alphonso kind and much sweeter. You can also use a fresh ripe mango if you don't have canned mango pulp. You might check the level of sweetness though. While waiting for the cream to boil, you have to watch it very carefully. As soon as some bubbles come up, turn off the heat and immediately add the lemon apeels. If you don't have lemon apeels, you can use white baking chocolate instead. I used Guittard lemon apeels for the dessert. I buy them directly from my local store, the Milk Pail Market, 2585 California Street, Mountain View, CA 94040, but you can order through eBay if you can't find them. 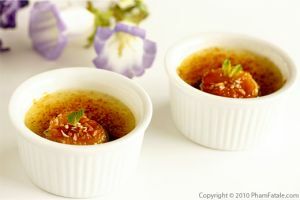 Click on the link for more dessert recipes using lemon apeels. I didn't add more sugar to the dessert because I think the lemon apeels provide enough sweetness. If you prefer, you can coarsely crush the gingersnap cookies and sprinkle the crumbles over the mousse. You can use any other crisp cookies for a nice balance in texture. You might also want to try pairing the mousse with tuiles almond cookies (literally "roof tiles" in French). 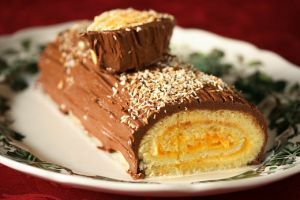 If you want to make the dessert more exotic, you could add coconut extract to the mousse and decorate it with slightly toasted sweetened coconut flakes. 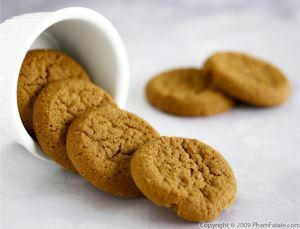 You can also sprinkle chopped candied ginger to repeat the same flavor from the ginger snaps. You can create your own twist to the mousse by using different chocolate chips (milk, dark, white, butterscotch, peanut butter, lemon apeels, mint apeels), by adding an extract to the vanilla chips (rose, pandan, peppermint, mocha, cherry) or by mixing any fruit purée. Let your imagination run wild! Published By: Jacqueline Pham on December 16, 2009. I tried using your contact form but it's not working for some reason. I'm writing a post about mangoes and desserts and stumbled upon your Mango Mousse recipe. I would like to include it in my post. I was wondering if I could use the picture too and link back to your recipe. I will send the link to my post when I'm done.